BUYSOUNDTRAX Records is proud to announce the release of SPACE SHUTTLE COLUMBIA: MISSION OF HOPE, featuring music composed by Blake Neely for the 2013 film directed by Daniel Cohen and producers Mark Herzog and Chris Cohen. SPACE SHUTTLE COLUMBIA: MISSION OF HOPE is the untold story of Colonel Ilan Ramon, a fighter pilot and son of Holocaust survivors who became the first and only astronaut from Israel, embarking on a mission with the most diverse shuttle crew ever to explore space. Ramon realized the significance of “being the first” and his journey of self-discovery turned into a mission to tell the world a powerful story about the resilience of the human spirit. Col. Ramon carried with him a miniature Torah that survived the Holocaust, an artifact representing a cross-generational journey through time and space. A labor of love for director Dan Cohen, SPACE SHUTTLE COLUMBIA: MISSION OF HOPE took seven years to make, and received the funds necessary to edit it for a PBS broadcast through Kickstarter. SPACE SHUTTLE COLUMBIA: MISSION OF HOPE originally aired on February 1, 2013, the 10th Anniversary of the shuttle disaster. Emmy award nominated composer Blake Neely first worked with producers Mark Herzog and Chris Cohen on Tom Hanks' IMAX film MAGNIFICENT DESOLATION: WALKING ON THE MOON 3-D. Neely has worked with Herzog and Cowen on a range of documentaries including Ted Kennedy and World War II. Simultaneously, Neely has worked with actor and producer Tom Hanks and his company Playtone Productions on projects including STARTER FOR TEN, THE GREAT BUCK HOWARD, and the HBO mini-series THE PACIFIC, for which Neely received an Emmy nomination. 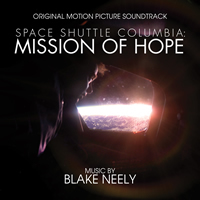 Blake Neely’s score for SPACE SHUTTLE COLUMBIA: MISSION OF HOPE mixes passionate strings, pulsing piano and somber brass to create a sense of reflection and quiet majesty, evoking the hopefulness and profundity of Col. Ramon’s space flight. The score soars with a grace and finesse that brings to mind the dexterity and beauty of space flight. Neely’s score encompasses all aspects of the film, from the spiritual journey the ascent of the Torah represents, to the space shuttle itself. SPACE SHUTTLE COLUMBIA: MISSION OF HOPE is a limited edition release of 1000 units. The first 100 copies will be autographed by composer Blake Neely.